Somehow or other the month of May got totally past me. My UFO didn't even get taken out of the box, although the box did get taken down from the shelf. But that was only because I was looking for some fabric that was in it. Maybe I'll get to it this month?? But probably not. I'm in the home stretch of a long stretch of shifts at work, ending this coming Sunday. My job after that will be to catch up on the customer quilts I have sitting here, waiting for me to do. I am so looking forward to the day, a little more than 2 years from now when, God willing, I can retire to quilt. I can't think of anything that would be much more pleasant than that. But, in the meantime, I quilt on my days off. And on the days I have to work, I play in my sewing room with relaxing stuff, to get my mind into the space it needs to be in order to work. I've made progress on the Heartland Star quilt. Turns out that the goof I thought I made with making too many units, wasn't a goof after all. I really did need all of them that I made. My reading skills really need to be improved. LOL!! I'm hoping to get a start on putting these units together today, before going in to work. Then I can start on the stars that surround the center. I'm glad I'm not the one who will have to lift this on the next pick up day. It might need to get divided up into the other bin, so that It can be carried to the curb. I hadn't opened any of those magazines in years, so I figured it was time to get them cleared out. Next will be all the odds and ends of knitting patterns I have, It's hard to come up with a good reason to keep them, when so much is available on the internet. So, I'll eventually go through them, keep the ones I really want, and ditch the rest. I was sitting on the couch, doing all this, but now there is hockey on, the first game of the last of the Stanley Cup series. I am NOT a hockey fan, so I've come upstairs to my sewing room, and I think I'll spend some quality time with my sewing machine. I'm going to keep an eye on the Facebook chat section as well, to see if Susan can come out to chat for awhile tonight. I spent a quiet day yesterday in my sewing room, and managed to get quite a bit done. Avignon Picnic is now a flimsy. I had been planning on putting borders on it, but when I hung it up on the wall, it told me that it was a perfect size for a twin bed, and that it considered itself done. I decided not to argue. LOL! pattern from Judy Martin's new book, Patchwork Among Friends, called Heartland Star. I have to say, yet again, that I love her patterns, the way they are written, and the quick cutting rotary techniques she uses. Of course, it always helps to actually read the instructions. Somehow, I ended up making eight of these units, instead of four, my fault, not the pattern's. But, I'm sure I'll find a use for the other four somewhere. The next step is cutting and piecing the diamond units for the points of the stars. That might take a while. This time I'll make sure I double check the actual amounts I need. LOL! I'm working today, and I still want to do some playing in my sewing room, and maybe get a start on the star points, so I'm making this a short one. As usual, I'm linking to Judy Laquidara's Design Wall Monday. If you've got a few minutes, there's always lots of fun stuff to see over there. I haven't done a stash report in quite a while. In fact, I haven't done anything quilty in quite a while. I think I'm about ready to go into withdrawal. I had a horrible night at work last night. In the middle of changing one of the patients, he suddenly became very resistive, and grabbed my right wrist, and twisted it. Then, he let go of it with one of his hands and started punching me. No permanent damage was done, but my arm is sore, and I'm just a smidge upset, so I've taken today off. I don't think it would be a good idea to be lifting with it today. So I think I'm going to treat myself to a quilty day. I might finish up Avignon Picnic. I might work on some New York Beauties. I might start something completely new. I'm not sure yet. When I went on my visit to meet Jannette, I bought some new fabric which I haven't reported on yet, so I'll add it in today. Balance: 62.75 more yards purchased than used. Maybe I can make a dent in some of that this afternoon and evening. If I do, I'll report in later on with the results. As usual, I'm linking up to Judy's Patchwork Times and her Sunday stash report linky. It's that time of year when I can't bear to be indoors. I've waited all winter for this, and I just HAVE to get out and enjoy the glorious warm sun and summer breezes. I love the summer, and even the hot weather and the humidity don't bother me. Unless the air quality deteriorates, in which case I have to surrender and retreat to the house. We're putting in a small vegetable garden this year. I've just started planting within the past week, so there isn't much to show for it, yet. I managed to get 2 rows of lettuce planted today, and 2 rows of multi-coloured carrots, with radishes in the same rows, to mark where they are, since the carrots take so much longer to come up. I used to have a gardening book that suggested doing this. Apparently it also helps in thinning out the carrots, as well. There are going to be 2 trellises across the width of the garden at the back. One for pole beans, and the other for cucumbers. The trellis across the short side of the garden has snow peas planted at the bottom of it. There is still spinach to put in, as well as yellow bush beans. I'm not sure if we'll be putting in tomatoes. The last 2 years in a row that we did tomatoes, they would set lovely fruit, start to ripen beautifully, and then would get some sort of fungus and would rot on the plant. We have lots of farms and farmer's markets quite close by where we can buy tomatoes for canning or freezing, if we decide to do that. There are two new Rhubarb plants. It might be a couple of years before we can get anything from them, but that's OK. I think there are a couple of little turnip plants just starting to peak through. I've never planted turnip before, so I don't have a clue what the new plants look like. And I'm pretty sure these are snow peas just starting to break through. I love watching as the little plants start to grow. Weeding, on the other hand............... I might have to make a deal with my hubby. I'll do all the planting, if he does the weeding. I wonder if he'd go for it? We're home from our camping weekend. We had a wonderful weekend, camping up at the park near Noel and Laurie's home. Other then the first day and night we were there, when it was quite cold, the weather was perfect. I don't know if there were temperature records set, but it was a glorious and warm weekend away. Lots of time spent outside, chasing the shade, relaxing and reading. Unfortunately, the wireless reception at the park was kind of hit and miss, so I wasn't able to do any blogging from up there. And, of course, there was time spent with family. After we arrived on Thursday, and got the camper mostly set up, we headed over to have supper with Noel and Laurie, Bill and Jan, who are Laurie's parents, and with Laurie's Grandmother, affectionately known as Gee-gee, short for Great-grandma. And, of course, we can't forget the birthday boy, Avery. When we had Laurie's baby shower, before Avery was born, Becca and I put our heads and hands together, and made the cake for the shower. Considering neither of us had ever attempted making a tiered cake before, It turned out beautifully. Once the shower was over, we had the top tier of the cake left. Jan very carefully wrapped it up, and stored it in her freezer, with the plan of keeping it, and taking it out to have as dessert for Avery's first birthday. I am still blown away by how fast that time passed. I think this might be the first time Avery has had chocolate. He had a fabulous time with it. 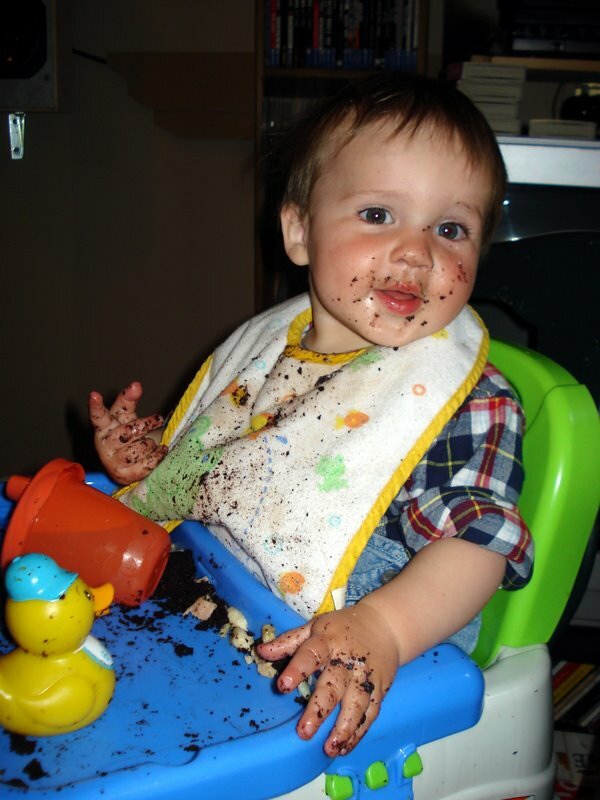 I don't know what it is about babies, and chocolate cakes and pictures of them with the cake all over their faces, but they are always cute, and never seem to get old, for being repeated. 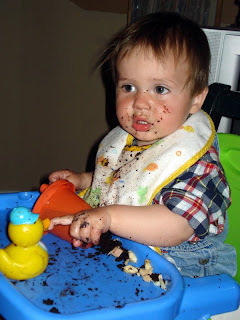 He's not as messy as some I've seen, but he sure is cute. It was fun to watch him take a tentative little pinch of the cake and taste it, and go from there to big hand fulls. What a joy he is. And he continues to turn this Grammy's heart to a melted puddle of mush. I actually have a video of him eating the cake, but I haven't had the time to upload it yet. I'll most definitely share it once I get that done. I had the wonderful opportunity yesterday to go and meet Jannettte. We've been corresponding through blog comments and emails for quite a while now, and decided that it was time to take the plunge, and actually meet each other. We met at the Tim Hortons for coffee in her little home city, which is about a 30 minute drive from here. Being myself, I was rather nervous about the whole thing, and felt rather awkward for the first couple of minutes. But after that, it just sailed. We must have sat and talked for at least an hour, sitting in the Tim Hortons coffee shop. It was wonderful. We have a lot in common. We are Christian sisters, both of us are nurses, although she no longer works in the profession. Obviously, we are both quilters, so there was lots to talk about. Then she took me to a little quilt shop, called Quilted Creations, that was having a sale for the month of May, with all fabrics being $10.00 a meter. That comes pretty close to what it costs to order from the internet, by the time shipping and import fees are paid, so I went for it. There is a quilt in Judy Martin's new book, Patchwork Among Friends that I really badly want to do, so with Jannette's help, the fabrics were chosen for it. It was so nice to have someone to shop and pet fabrics with. LOL!! This was the selection I ended up with And, of course, I'm just itching to get at those fabrics and start cutting and playing, but they are going to have to wait. It is Avery's first birthday tomorrow, and we are going on our first camping trip of the season to go and see them. I can hear my husband outside in the lane way cranking up the trailer, as I type this, so I'd best get up and off the computer and start to help get everything ready, so all we have to do tomorrow is pack up the coolers, hook up the trailer to the car, and go. My next post will be from the beautiful region of Georgian Bay, with lots of pics, and maybe a video or 2 of our precious grandson and the rest of our beautiful children. There would be no Mother's day for me, without my children, for whom I thank God daily, and pray for daily. I thank Him for Noel, my firstborn. He has such an easy going nature, most of the time. He is quiet and reserved, much like his mother. 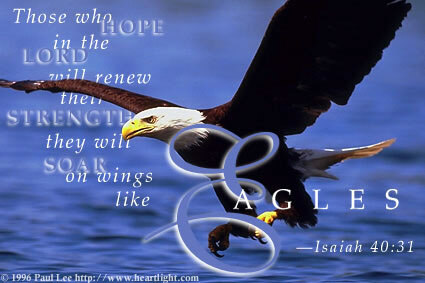 But there is a kind and generous and gentle man, underneath the reserve, with a strong loyalty to those he loves. He has become a father in the past year, with all it's trials and self doubts. He has come through it, and is a good father to his son. I am so grateful that he is my son, and couldn't be happier with any other son. And then there is Rebecca, affectionately known as Becca. When I was carrying her under my heart, I prayed for a daughter, and God answered my prayer with her. She has been a joy right from the start, even with all her wildness and energy when she was young. When she was born, we considered for a while giving her "Joy" as her middle name. I sometimes wish we had. She is wise, and outspoken in her opinions. If she feels or thinks something, she lets it be known without any doubts. She also has the quality of loyalty, defending those she loves, even while seeing them exactly as they are, and loving them anyway. She is the opposite of both her brother and her mother, being an outgoing and social person. How I wish I could be more like her. Laurie, Noel's wife, my Daughter-in-law, but I prefer the term Daughter-of-my-heart. She is the perfect match for Noel. She has stuck with him, and supported him with her love through many difficult times, for which I deeply thank her and love her. But I also love her for herself. She is Noel's other half. She is outgoing and talkative, organized and motivated. She can see a goal and take the steps necessary to achieve it. She too is deeply loyal to those she loves, and a fabulous mother to our grandson, Avery. I am so grateful that God brought the two of them together, and I pray daily for His blessing in their lives. And last of all, there is Matt, Becca's husband, and the Son-of-my-heart. When I had Becca, I started praying that God would send the man she was to marry early into her life, and that prayer was answered in Matt. He loves her deeply, second only to his love for God, and looks after her the way a mother hopes her daughter's husband will. He is hard working, diligent and responsible. He knows what he wants, and plans carefully for it, including I suspect, planning for capturing Becca's affections over 10 years ago when they first met. He too, is deeply loyal to those he loves, and very protective of them. It has been a joy and a privilege to be Mother to these four wonderful people. Thank you, Lord, for bringing them into my life. A month or more ago, Laurie asked if I could make Avery some more diapers. Originally I had made mostly fitted diapers that required some sort of fastening, and then a cover to go over them. Then there were maybe a dozen "Pocket diapers" that had snaps to do up all across the front, as well as down the front to adjust the sizing. The beginning of the diaper story is here. Avery is really busy, and really squirmy during diaper changes, so the separate diaper and diaper cover weren't working very well. And the snaps take longer to do up and undo than he is willing to stay still for. So I've amended the original pattern. I've left the snaps going down the front, so that size is still adjustable. They don't have to be done up at every diaper change. But the snaps across the front have been replaced with some good quality Aplix fastener, which is like Velcro, only more sturdy. The soft part of the Aplix goes right across the front of the diaper. Then the hook part goes on the inside of the back tab to do them up. It has a fairly strong hold to it. I sewed a same sized square of the softer size of the Aplix beside the hook part. And I must say that the Aplix is a whole lot easier to put on than all those snaps were. It can be folded back onto it to prevent all the diapers snagging on each other during washing. Apparently this also helps the hook part of the Aplix tape last longer, and doesn't pick up as much lint and gook that velcro type tapes often do. I have 2 of them done, so far, out of the 10 I have cut out. I'm going to work on them some more before going in to work today and tomorrow. I'll be taking however many I have done up with us when we go see them next week for Avery's first birthday. That has to have been the fastest year of my life. How did he get to be a year old in what just seems like a couple of weeks? Christine picked up her quilt today. It is a lovely Fractured Square, done in wonderful autumn colours. She backed it with some lovely flannel fabrics, in a pieced backing. It is difficult to see the quilting design, but it is a pantograph called Leaf Pile by Donna Reinarts. before, so we only got 4 pounds of it, as a start. We had some for supper, and he has decided that he likes it, so we'll probably go back for some more, if we get time before it goes out of season. The house smelled wonderful, as we were blanching it and getting it processed for the freezer. It's been a long day, with lots of time spent standing in the kitchen, so tonight, I'm going to sit in my comfy recliner and watch some of Season 7 of Star Trek, the Next Generation, and work on Becca's Christmas Stocking. I'm working the weekend, so I need to take it easy for the rest of the evening. We went for a lovely, if short, drive yesterday, to pick up our meat order. I really didn't know what to expect, since we've never done this before. There is a lot of meat in a quarter of a cow. This should keep us going for a long, long time. It took quite a while to figure out exactly how we were going to store in in the freezer, so that it would be at least semi-organized, rather than just dumped in there. I finally decided to put the things that are the same into large freezer bags together, and label the freezer bags. The meat is already labeled on the freezer wrap, but I thought there might be a chance of it getting smudged over time, so re-labeling it couldn't hurt. Everything got put into freezer bags, while still wrapped in the freezer paper, to give it added protection from freezer burn, since there is enough there to last us a lot longer than just a couple of months. I can't believe how excited I was, and still am, about this whole process. I was talking to my dear friend and sister in the Lord and kindred spirit, Susan on facebook chat the other night, and we got to talking about the Christmas stockings I'm doing up for the kids, and how far I've gotten, so I said I'd take pictures and show her. Matt's is finished, or at least the front of it is. I was going to put his name on it, but then I figured that it is obvious whose it is, and that it would be an unnecessary step. The golf clubs in the bag actually sit in there, and can come out!! This has been so much fun to do. I've gotten a start on Becca's, as well, and it is going a lot faster than Matt's did, simply because I now have a better idea of what I'm doing. It will be a manger scene when it is finally done. These stockings have taken over the time I used to spend doing applique and knitting, but it will be so worth it when the kids see them. I hope they love them as much as I think they will. And now, I have lots of stuff to do. I was waiting for a shipment of bobbin threads to come in, so I was stuck for doing any more machine quilting. The threads finally got here on Monday, so today's task is to take my Rose Log Cabin off the machine, unfinished unfortunately, and get working on the customer quilts I have waiting to be done. Christine's goes on first. I also want to do something about getting some asparagus done down for the freezer. And then we are going for our first camping weekend on May 17th, which also happens to be Avery's first birthday, so there is some work to do to get the trailer ready, and packing done. And then Laurie has asked for some more all in one diapers, and I'd like to have them done before we go up to see them so that I can give them to her then. And, somewhere in there, I have to fit in 2 shifts at the hospital over the weekend. Whew....... I'm tired just writing all that. If I'm absent for a while, this will be the reason. One of the loaves is left out for our use and the other is in the freezer. I separated the 12 grain rolls into packages of 4, so that we aren't taking out more at a time than we'll use, since there are no preservatives in this bread, so it goes mouldy faster. I am loving having a freezer again. There's a couple of things up on the wall today. I have half of Avignon Picnic sewn together, and the second half is now taken down, and sitting by my machine waiting for me to have a few minutes to work on it. The hardest part of this quilt was arranging it so that no 2 colours were touching. There are a couple that I couldn't avoid, no matter how hard I tried, so it is going to stay the way it is. Over all, I'm happy with the balance of colour in it. I have yet to decide about borders for this. I have Judy Laquidara's book 60 Pieced Borders, so I'm sure I can find something in there. And then there are the NYB's. This is the last week of the NYB sew along. Past this point, I'll be doing blocks from EQ7. This is the general idea of the layout I think I'll use. I'm trying for a balance of colour, but also for the seams to be staggered, so that there isn't a lot of matching up to do and not a lot of thicknesses at any one spot. As usual, I'm linking to Patchwork Times where Judy hosts the Design wall Mondays. Just a small amount used this week for 4 New York Beauty blocks. I'm figuring 4.5 inches of fabric per block, given the amount used for the paper piecing that needs to be trimmed after each piece is added, and the amount it takes for the curved pieces. Balance: 52.75 more yards in than out. On another topic, we're making great progress on our cost cutting measures. Scott and Matt picked up the freezer on Saturday. And the meat grinder arrived as well, this past week. So Matt and Becca treated us to a guest shopping excursion at our local Costco. We used to have a membership there, but found we didn't have enough self discipline to go in there for just what was on our list, and nothing else. We'd see all the great "deals" and "bargains" and come home having spent way more than the savings we were trying for. This time we managed to stay focused. We picked up quite a few large cuts of meat which we then came home and cut down into smaller portions. We had 2 largish center round cuts of beef that we used the meat grinder on. In the space of about 30 minutes, start to finish, there were 12 approximately 1 pound bags of ground beef. Not a bad investment at all. And we've been in touch, thanks to Jannette, with a beef grower in our area to purchase a quarter of a cow. And my daughter-in-law, Laurie, has suggested that we try the Freshco food store, rather than the Loblaws, or the NoFrills, as a more economical grocery store. Ellen sent me a link for this site http://budgetbytes.blogspot.ca/, which had a couple of recipes that immediately caught my eye. Who could have thought that blogging would end up saving us money, as well as being a fun thing to do. In a post last week, I talked about some changes that have been happening in our lives, and some things we were going to do to try and cut costs to accommodate those changes. One of them was to stop using commercial laundry detergent, and to make our own from a recipe found here. We did it, or should I say, Scott did. From the time he started grating the bar of sunlight soap, to the time when all of it was mixed and poured into the containers took 20 minutes. Twenty minutes, to save the cost of 3 containers of laundry detergent purchased at the stores. The bars of sunlight soap cost about $4.00 for 2 bars, and we only used one. So for maybe a total of $3 to $4 dollars, we have the equivalent of about $21.00 worth of laundry detergent. It is very concentrated, and uses only 1/4 to 1/3 cup per load. This was most definitely worth doing.. It's just past midnight, so technically, it's no longer today. But I got done what I wanted to. Four more New York Beauties. Two in last month's colours, and 2 in this month's. What I am finding so interesting, is that all of the colours from the different palettes are playing very well together. This month's, which are the top left and the bottom right, are a bit brighter than the tones I've used so far, but they still all work. I don't have the time, or the energy, right now, to put them all up to see how they all look together. Maybe in the next couple of days. It was my original plan to see if I could get even more of these done, but I got side tracked by some gorgeous weather, my comfy swing in the back yard, and a good book on my ereader. It's supposed to be even warmer over the next couple of days. Maybe I'll get my first morning coffee out in the swing soon, something I always look forward to each spring. The palette for May was posted yesterday, and it has such bright and happy colours in it. I borrowed this picture of the palette from Judy's post about it here. These colours, and I have lots of them in my batiks collection, I'm sure, are a lot of fun, and should make up some great NYB's. Yep, this decides it, I'm playing with bright candy coloured fabric, and paper pieced blocks today. Maybe, I'll write a post later on today, and show what got done. 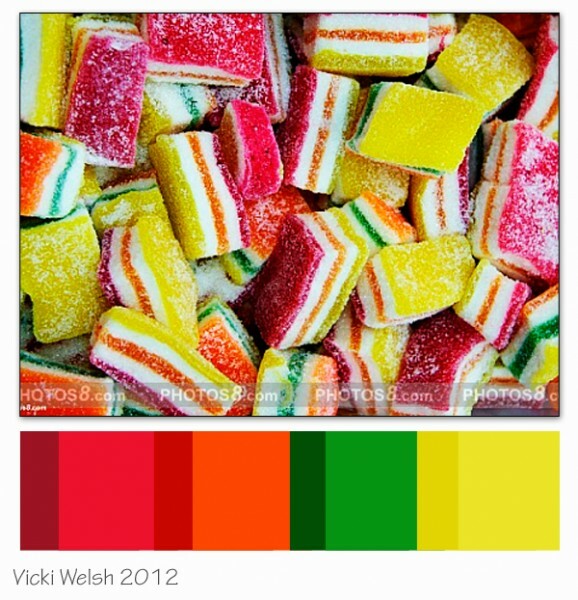 I'm linking up at Judy Laquidara's Patchwork times linky for the Showing of the April's colour challenges. There are some fun things to see there.